The RS400 is a fast, light two-man asymmetric dinghy that is an ideal candidate to fill an obvious gap in the Club’s line-up of adopted classes. Designed by Phil Morrison in 1993 the RS400 is constructed from GRP/Foam sandwich by RS Racing and weighs 85Kg. It is suitable for a combined crew weight in the range 135-165Kg and sails off a handicap of 952. Number of boats at DQSC (December 2009):Rather a lot! 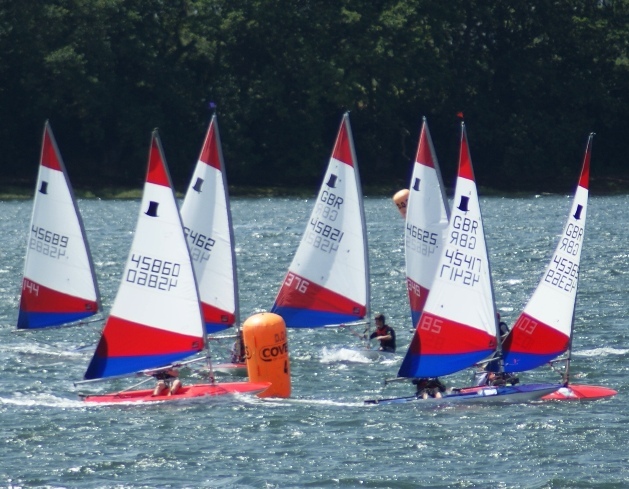 The Laser is an extremely popular single-handed Olympic Class boat. Formerly an Adopted Class at DQSC, it is seeking to boost turnouts to gain reinstatement. The Laser was designed by Bruce Kirby in 1971. It is constructed from GRP, weighs 56.7Kg and is built by Laser Performance Europe Ltd. Smaller rigs are available for those of lighter build. It sails off a handicap of 1078. 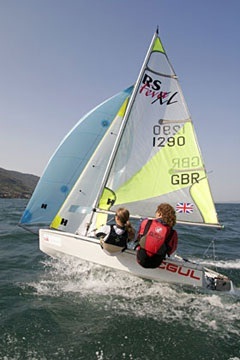 The RS Feva is an asymmetric dinghy suited for juniors or small adults. It is an ideal two-handed boat for younger teenagers and well-suited to the Club. Designed by Paul Handley/RS Sailboats in 2002, the RS Feva weighs 63Kg and is suitable for a combined crew weight in the range 80-115Kg. It is built in polyethylene by RS Racing and sails off a handicap of 1189. Number of boats at DQSC (December 2009): Rather a lot! 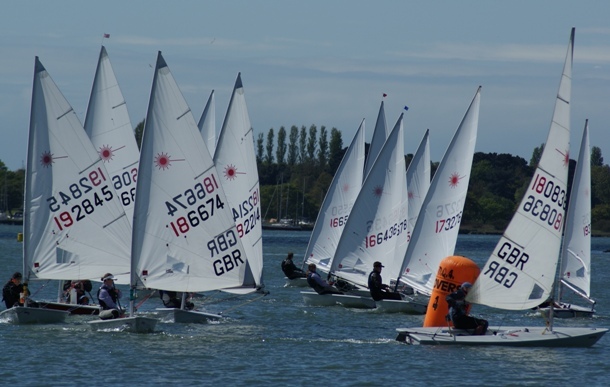 The Topper is a very light single-hander ideally suited for younger sailors. It is a perfect boat for DQSC. The Topper was designed by Ian Proctor in 1976 and weighs just 43Kg. It is manufactured in polypropylene by Topper International. The Topper can be sailed by anyone weighing over 32Kg and sails off a handicap of 1290. 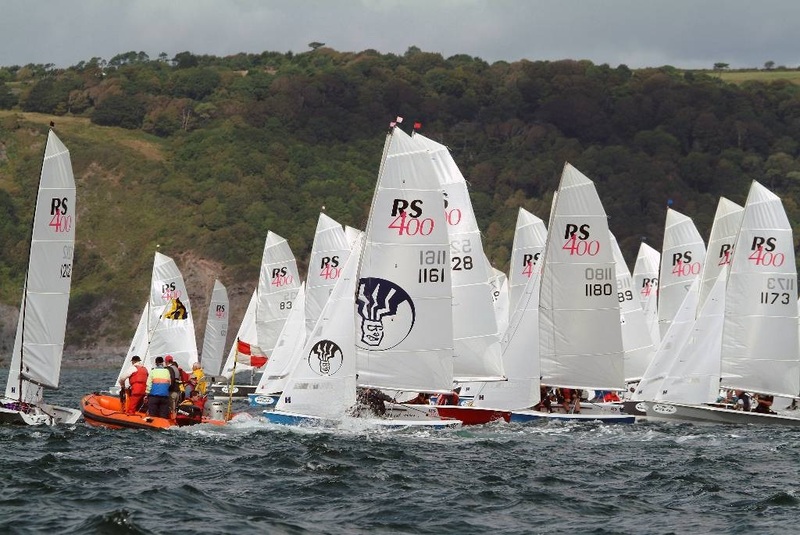 The Optimist is a common starting boat for juniors: 85% of the medal-winning skippers at the 2008 Olympics were former Optimist helms including Ben Ainslie. Masts can be raked and sails cut to suit individual helms so everyone can compete on an even basis. The Optimist was designed in 1947 by Clark Mills and weighs just 35Kg. 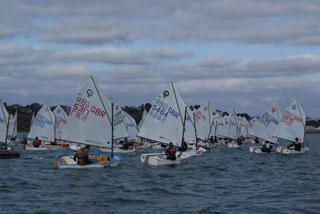 It is very much for lighter juniors in the weight range 40-45Kg although the maximum age to race one is under 16. These days Optimists are constructed in GRP and there are many UK builders. Its handicap is 1646.